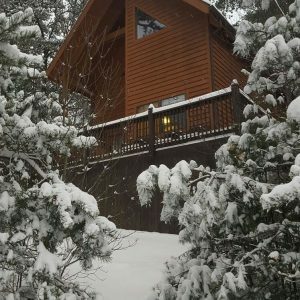 If you’re looking for a place to relax and unwind, you’ve found the perfect Blue Ridge Mountain Cabin Rental. We are located just off the Blue Ridge Parkway in the heart of the Pisgah National Forest. We offer family friendly cabins that your whole family will enjoy. We also specialize in honeymoons, birthdays and any type of celebration you can think of! Just bring the ones you love and we take care of the rest! Everything is included, linens, towels, fully stocked kitchen. Enjoy grilling out overlooking the Blue Ridge Mountains with our grill and relax on our porch and take in the sunsets. 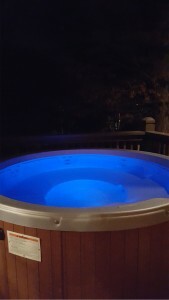 Our hot tubs under the stars have rave reviews with our guests as well. Our Blue Ridge Mountain cabins are centrally located to Boone, Asheville and Blowing Rock, perfect for day trips! Drive the Blue Ridge Parkway through 26 tunnels, 469 miles of winding curves, mile high peaks and cascading waterfalls. We offer $10 off per person if you want to visit America’s Largest Home, the Biltmore Estate. When you’re on the porch of our Blue Ridge Mountain Cabin Rental, you feel like you’re in the middle of nowhere but you’re actually only 15 minutes to town, dining, shopping and local culture. We can set you in the right direction for so many things to see and do in the area. Jill, the owner has been hiking these mountains for ten years and knows all of the hidden gems which she publishes daily on Facebook. Once you book, you’ll receive a detailed welcome packet with all these places to visit. Hundreds of waterfalls surround our cabins and even walk to 3 from our porch. Gem mining, tubing, rafting, fishing, shopping are all near by. See the forest by horseback and enjoy going through the river many times! In the winter you can snow tube, ski and ice skate! Pick your dates and book online today! Be sure to check out our customer reviews! We also have coupon codes for extra discounts off our already low prices!